Snow Falcon is due to carry 11st 5lb if he takes up his entry in the Ladbrokes Trophy at Newbury on December 1. Noel Meade’s Kerry National hero followed up his Listowel triumph with victory in a Grade Two contest at Down Royal on Saturday. 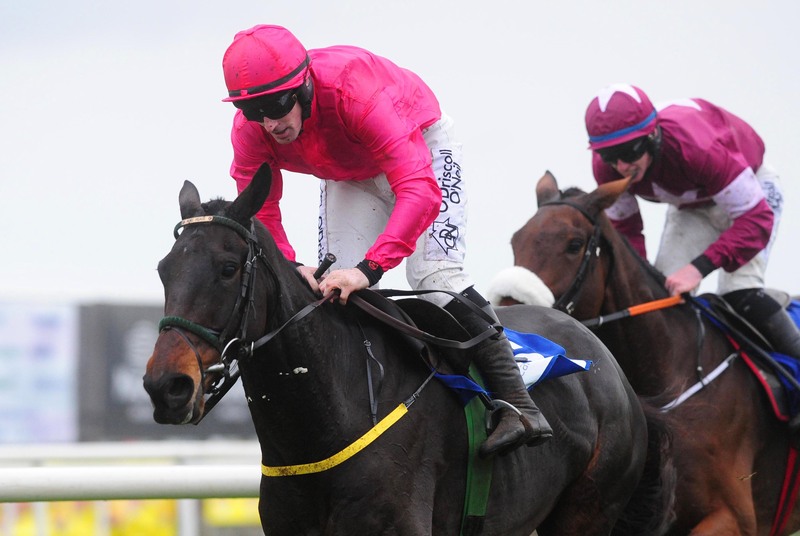 He is one of 12 Irish-trained possibles for the race formerly known as the Hennessy Gold Cup. Willie Mullins has eight entries including last year’s winner Total Recall on 11st 3lb – 9lb more than he carried in 2017. His other contenders include Al Boum Photo (11st 6lb) and Kemboy (11st 4lb), while Gordon Elliott’s Don Poli (11st 7lb) is second in the weights behind the Colin Tizzard-trained Thistlecrack (11st 12lb). Alan King will give Dingo Dollar a prep run at Newbury on Thursday with a view to returning for the Ladbrokes Trophy. King took the prestigious staying handicap chase with Smad Place in 2015 – and has Dingo Dollar in mind after he was given 10st 9lb when the weights were announced on Wednesday. The six-year-old improved last season, registering two successes over fences – including a 15-length victory in a novices’ handicap at Newbury. “Dingo Dollar is in in good form at home, and we are looking to head for the Ladbrokes Trophy,” said King. “We would like to get one run in beforehand, and he is declared to run at Newbury over hurdles. David Pipe, who saddled Madison Du Berlais to score in 2008, is considering the Ladbrokes Trophy for Un Temps Pour Tout – not seen out since winning at the Cheltenham Festival in March 2017. “Un Temps Pour Tout is back, and we are looking forward to this season with him,” said Pipe. “He missed last year through injury, and we are hoping to have a full season with him this time around. “He will be entered in the Grand National as his long term target, and other long-distance chases will be on his agenda. Paul Nicholls, who has won this race three times as a trainer, has six entries this year – including Black Corton, who was second in the Charlie Hall Chase at Wetherby on his reappearance. “Black Corton ran well behind Definitly Red in the Charlie Hall Chase,” said Nicholls. “The winner was rated 11lb higher – so our horse ran a really good, solid race. “The Wetherby race was a step up in class to what he was running in last year, and he ran well. “Black Corton (who won eight races last season) won’t find it as easy as last season, because it is a bit of a different ball game – he was able to boss around horses that he was better than. Terrefort is the 8-1 favourite with the sponsors after being allotted 11st 5lb, and Nicky Henderson’s charge could attempt to be the first five-year-old winner. Henderson has also entered Vyta Du Roc, Janika and Beware The Bear.